...And pain. They can be no more separated than birth and blood. This is gorgeous! 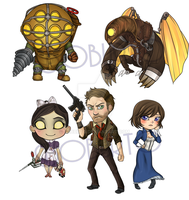 Bioshock Elizabeth is my favorite. There's just something about the underwater city and 1950s aesthetic that's so nostalgic. I love this design! I was wondering if you would be okay with me getting this as a tattoo? It is so lovely!